The Commission is currently drafting its “road initiative”, which consists of two main objectives: one is the protection of the rights of truck drivers and the other is a promotional mechanism to encourage a cleaner freight transport system. If done properly, this will have a positive impact on ending the exploitation of foreign truck drivers while also reducing CO2 emissions from road transport. However, vans simply bypass all of these laws and, if the Commission fails to address this, it could open the door to the further exploitation of drivers and result in dirtier and more congested roads. The use of vans has exploded since Europe set up its internal market in the 1990s. For example, between 2000 and 2010, the number of vans on German roads doubled. This is not because Europe has suddenly needed a lot more plumbers and electricians; it is because vans are increasingly used for goods transport. This has something to do with internet shopping, but more to do with van transport being made artificially attractive by the absence of proper European legislation. From an environmental perspective, this is bad news. Vans spew out NOx at levels that are seven times the legal limit and the useless van CO2 standard makes this vehicle segment a technology graveyard. Note 1. Vans are truly the neglected outlier of Europe’s freight transport policy. Van drivers don’t require special training or driving licenses, while truck drivers do. Van drivers are not required to rest, unlike their HGV counterparts. Neither do vans face any cabotage restrictions, meaning foreign drivers can stay in another country while still being subject to the national laws of their home country. Note 2. Light commercial vehicles do not pay the road tolls that trucks pay under ‘Eurovignette’ rules and they have no speed limiter, while trucks (rightly) can only go at a maximum of 90km/h. Almost all of these laws are up for review. In 2017 the Commission will review the social legislation for road freight, including cabotage, posting of workers and access to the profession. It will propose new van CO2 targets, new safety requirements – as part of the General Safety Regulation – and the Commission will update Europe’s road toll laws. Transport operators (the IRU) and Transport & Environment have urged the Commission to seize this opportunity to start levelling the playing field between vans and trucks. Note 3. The Commission’s response was, well… intriguing. The transport directorate claimed vans are not an EU issue because vans are not used to cross borders. We at T&E are curious people so we decided to put this to the test. We spent a few days at the Belgian-Dutch border and Belgian-German border. (We just love the smell of fresh NOx in the morning.) While there was one van for every three trucks on the Dutch border, there was one van for every single truck crossing the German border. The (political) challenge is of course that vans are used by SMEs (though multinationals make plentiful use of them too). Imposing all sorts of additional requirements on bakeries, electricians and plumbers isn’t exactly an election-winning proposition these days. So the “vans loophole” continues to exist. The key to this political conundrum is to distinguish between vans used for commercial goods transport and vans being used by skilled workers. So we have a huge social issue, a growing environmental problem, but also a solution. 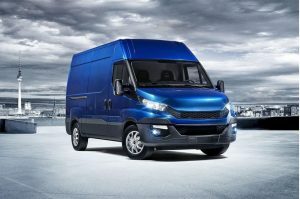 It ought to be a no-brainer for the Commission to make vans a big priority in the upcoming “road initiative”, as well as in the new standards they are drafting for CO2 emissions post-2020; to eliminate this legislative loophole that will only increase the exploitation of workers (as well as CO2 and NOx emissions) if left ignored. Note 2. Catherine Stupp, “Bulc wants truck drivers to get paid a minimum wage,” EurActiv (20 Aoril 2016). Sam joined T&E in August 2015 after two years working at the Linklaters law firm in both its Paris and Brussels offices. During his time at the firm, he specialised in the field of competition law and worked on cases in the financial, pharmaceutical and automotive sectors. Sam will further T&E’s work on rail and will also be part of the lorries team. From the east coast of Ireland, Sam completed a bachelor of arts degree in classical studies at University College Dublin before switching to law and, subsequently, completing a master of laws at the University of Amsterdam. He speaks both English and French. When not at work, Sam can be found playing sports, watching documentaries on Netflix or relaxing with friends.